A 3 BEDROOM period cottage offered with NO ONGOING CHAIN situated in this sought after picturesque village. This quintessential stone cottage, built we believe in the 1500s for the farmworkers of Lakers Farm, has undergone some improvements to include a new roof in 2015 using re-claimed tiles, along with a replacement Vaillant combi gas boiler in 2011 providing instant hot water and central heating to radiators. The property has retained some of its period features, the ground floor bears oak beamed ceiling joists whilst internal doors are ledged and braced and fitted with cast iron door latches. 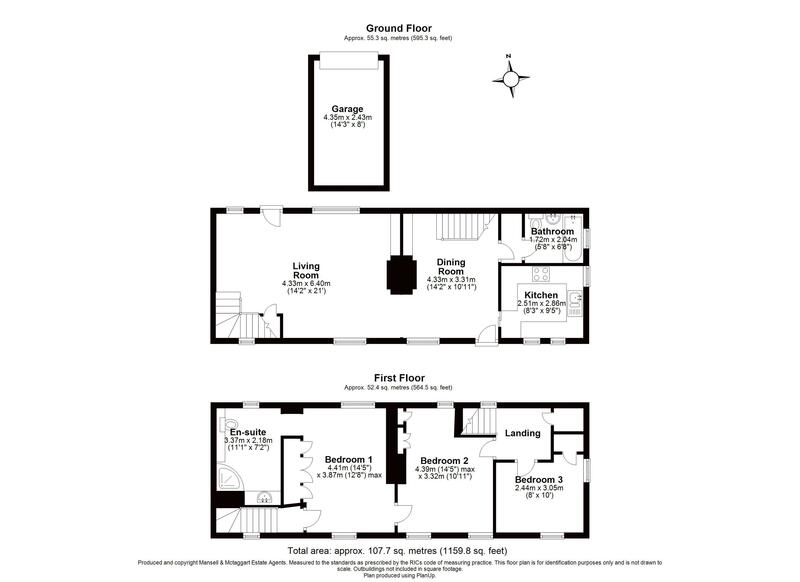 Upstairs, has high, hipped, cottage-style ceilings along with loft access hatches located to Bedroom 2 and the En-suite Shower Room. The main front door opens into the DINING ROOM which lays open plan to one side through a wide ceiling arch into the double aspect LIVNG ROOM with windows to the front and rear in addition to a staircase located to the far end, whilst both rooms share a double-ended open brick fireplace creating an interesting and characterful feature. Off the dining room, is the double aspect KITCHEN positioned to the front and fitted with cream-coloured country-style units with a decorative tiled splashback, solid woodblock work surfaces and an inset 1½ bowl white ceramic sink with mixer tap. An integrated, electric Hotpoint double oven with grill is positioned below an electric, Zanussi ceramic 4-ring hob with extractor fan above. Freestanding appliances also form part of the sale and include a Bosch dishwasher, a Hotpoint under-counter fridge and a Beko under-counter freezer. Also off the dining room is a door to a LOBBY AREA located under the stairs where there is coat-hanging space, wall shelving and a plumbed-in Zanussi washing machine. A further door then opens into the part-tiled BATHROOM fitted with a Victorian style suite comprising a deep cast iron bath with an ornate mixer tap and shower attachment, a wall-hung wash-hand basin and a low-level WC with a concealed cistern. There is also a window installed with textured glass. An additional staircase rises from the dining room to the first floor landing where a deep airing cupboard is located and houses the Vaillant combi gas boiler along with high level slatted shelving. BEDROOMS 2 AND 3 are both positioned off this landing, with each being of double aspect and having built-in wardrobe cupboard(s). The MASTER BEDROOM connects through a doorway to bedroom 2 but also has its OWN STAIRCASE, complete with built-in book shelving, and leads directly to the living room below. There are ceiling to floor fitted wardrobe cupboards and an open archway through to a spacious, part-tiled, EN-SUITE SHOWER ROOM installed with a white suite comprising a glass corner shower enclosure with double sliding doors and fitted with a mains-fed thermostatic shower controls, a modern and stylish oblong basin sat upon a vanity unit with a storage cupboard beneath and a low-level WC, and lastly, a window with patterned glass to the rear. The staircase to the ground floor has a storage cupboard beneath and houses the consumer unit. An external rear door to the living room opens onto a pathway with steps up to the rear cottage-style garden. OUTSIDE, TO THE FRONT, is a footpath laid to flagstones incorporating flower beds and leads to the front door. TO THE REAR, an elevated cottage-style garden, displays a variety of plants, shrubs and roses, with a raised area of lawn to one side and a patio to the other. A STORAGE SHED is positioned to the far corner and is complete with light and power. A pathway leads through the centre of the garden with steps down to a gate where a SINGLE GARAGE is located beneath the garden which is also complete with light and power. Lakers Farm Cottage is situated within walking distance of West Chiltington's old village centre with its Post Office/shop, local primary school, 12th Century church and Queens Head public house. There are further amenities close by at West Chiltington Common, also with a Post Office/convenience store, butchers and hairdressers. Other schools can be found in neighbouring towns and villages. Storrington, which is situated on the fringe of the South Downs National Park, is a short car journey away and provides a wider range of amenities including Waitrose and Boots, library and banks. The nearest mainline station is at Pulborough which provides a service to London Victoria/London Bridge and Gatwick Airport. There are two major trunk roads in the area, the A24 and A29, giving access to the south coast, Horsham and beyond. Recreational facilities nearby including Chanctonbury Leisure Centre and golf can be found at the West Sussex Golf Club, gliding at Parham and polo at Cowdray Park. The south coast is a short drive away whilst the shopping centres of Worthing, Horsham and Chichester are all within close proximity.